Warning is the sixth full-length album by Green Day, released in 2000. Building upon its predecessor, Nimrod, Warning eschewed their trademark punk rock sound and incorporated acoustic elements. 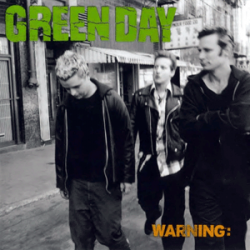 Warning was also the first Green Day album that was not produced by Rob Cavallo since Kerplunk, although he did have a hand in its production and was credited as executive producer.Warning reached number four on the Billboard charts and went gold. Despite its high critical response, it represented the lowest commercial slump in the band's career since their first album. It is also the only Green Day album, apart from the debut, not to go platinum. The album has sold over 1.3 million units worldwide as of 2008.Warning was reissued on vinyl on July 14, 2009. Warning and Minority are featured on the new game by Harmonix, Green Day: Rock Band.